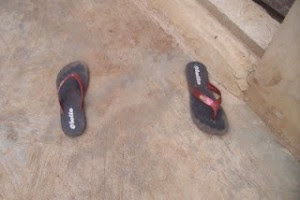 A depressed woman has ended her own life in Lagos. 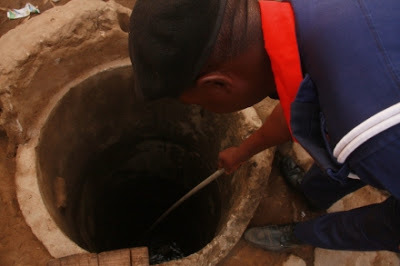 The 53-year-old mentally unstable woman identified as Amoke Adeoko reportedly jumped into a deep well in her house at #5 Ajilekege Street in Idimu on Friday night hours after one of her children sent a gift to her through a fellow who lives on the opposite street. According to sources, Adeoko was abandoned by her children and has been battling serious mental problem before she took the decision on Friday. Her lifeless body was pulled out of the well around 11:05pm by Alausa Fire Station officials. “The woman was said to be in control of one of the storey buildings in the compound which her late husband left behind for her. But her children abandoned her because of her state. “On Friday, one of her children was said to have come around the house and bought a gift for her. Unknown to him, the woman cited him afar with the man sending the gift to her through somebody else and did not come to see her. “It is probably that the woman might have regained consciousness at that time. She then deliberately jumped into the deep well and was brought out dead,”. 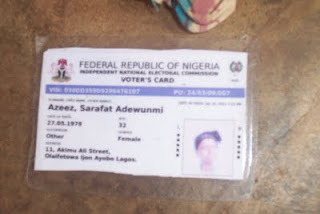 Voter’s card spotted in her apartment. How can they abandon their mother because she’s mentally unstable. Why not care for her??? @Tay you are wrong. Not all males abandone their parents at old age. The wives may want to make you abandone your parents but it takes you putting your feet down and say no than to heed to the wife’s advise. Nothing will make a strong willed man to abandon his parents. There are women too who abandon their parents but it is more prevalent among lilly livered men. God dont give us bad children,let them follow mestration away,now they will all come out to take over house, her late husband left for her,RIP. WOMEN NEED TO PREPARE THEMSELVES FOR WHEN CHILDREN WALK AWAY AND HAVE THEIR OWN FAMILY. THE AFRICAN NEED TO STOP THIS MENTALITY OF MY CHILDREN WOULD TAKE CARE OF ME, IF YOU GET CARRIED AWAY THINKING THAT CHILDREN WOULD FEED YOU WHEN YOU ARE OLD , YOU MAY END UP DIE OF STARVATION. BECAUSE THE CHILDREN HAVE THEIR OWN PROBLEM AND FAMILY TO LOOK AFTER. THEY MAY NOT HAVE ENOUGH MONEY TO CARE FOR THEIR OWN FAMILY, SO HOW WOULD THEY COME TO FEED YOU. AS YOU PREPARING YOUR CHILDREN FOR THE FUTURE , SO YOU TOO SHOULD PLAN FOR YOUR OLD AGE, IF YOU DO NOT WANT TO BE A SLAVE FOR YOUR SONS WIFE , OR YOUR HUSBAND DAUGHTER ASK YOU TO IRON HIS SHIRT. IT DOES NOT MATTER EITHER FEMALE OR MALE CHILD , SOME FEMALE CHILDREN ARE MORE WICKED THAN THE MALE CHILD SOMETIMES. AND WHEN SHE VISITED HER ,SHE WILL NOT BRING ANY SHOPPING OR SPEND UP TO TEN MINUTES. SHE WROTE TO THE SOCIAL SERVICE THAT THEY SHOULD TAKE HER MOTHER TO NURSING HOME BECAUSE SHE AND HER HUSBAND WANTED TO MOVE TO THE FAMILY HOME ,. 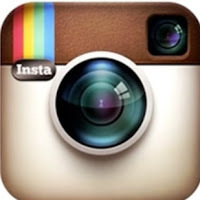 Has it solve the problem? They abandon you, and you abandon God by jumping inside well,bring everlasting punishment over yourself. Why must someone aboundon his or her own aged mother.For christ sake, it is unfair. May God forgive them. IT WAS WRONG TO JUDGE HER CHILDREN, BECAUSE WE DO NOT KNOW THE KIND OF PROBLEM THEY ARE FACING IN LIFE. LIFE MAY BE DIFFICULT FOR THEM , AND THEY MAY HAVE TRAVELED ABROAD , AND END UP BEING LOCK UP IN PRISON. PARENT SHOULD NOT SPEND ALL THEIR MONEY ON THEIR CHILDREN , AND NOT THINKING OF THEIR OWN FUTURE, IN WHICH, IF THE CHILDREN FAIL TO KNOCK ON YOUR DOOR , YOU WILL BE ABLE TO CREATE LIFE FOR YOURSELF . CHILDREN ARE SOMEONE ELSE, PARENT SHOULD STOP HAVING THE MENTALITY THAT CHILDREN WILL COME BACK TO CARE FOR THEM . SOMETIMES SOME CHILDREN ARE HOOKED UP UNDER THE SPELL OF EVIL WIFE . MAY BE THAT WHAT HAPPENED TO HER. A LOT OF PEOPLE DROWN IN ITALY , LAPEDUZA WATER EVERYDAY, OVER 2000 DROWN FROM JUNE TO DATE, EVERYDAY SO MANY STORIES. IN ISRAEL OVER FOUR MILLION AND IN EUROPE OVER EIGHT MILLION AND IN AMERICA AND AUSRALIA AND MANY OTHER PLACES , PEOPLE WERE LOCKED UP IN PRISON. SO , MAYBE THEY DID NOT ABANDON HER . IT IS JUST THAT LIFE WAS SO DIFFICULT FOR HER CHILDREN. SO, AS YOU ARE GETTING OLDER, YOU NEED TO UPDATE YOURSELF AND PLAN MORE AND MORE , AND ALWAYS HAVE IT IN YOUR SCULL THAT THE CHILDREN MAY NOT KNOCK AT YOUR DOOR. MAY BE SOME OF THESE SO CALLED PASTORS OR IMMAM OR SPIRITUALIST TOLD THEM NOT TO GO TO THEIR MOTHER , BECAUSE THEIR MOTHER WAS ONE OF THE WORKERS OF INIQUITY. nothing was wrong with the woman but her step wife make life miserable for her and this woman really fear her step wife but God knows the best and in this life you shall reap what you sow and if you’re still alive you don’t know what kind of death that is going to kill you.